This tutorial will walk you through the functionality and the main features of the RadDiagramContainerShape. Please note that the examples in this tutorial are showcasing Telerik Windows8 theme. In theSetting a Theme article you can find more information on how to set an application-wide theme. The RadDiagramContainerShape allows you to place multiple shapes into one container shape. The RadDiagramContainerShapes are, much like groups , a way to logically combine other shapes but add to this the capability to have a visual wrapper including a header. You can drag shapes in and out of a ContainerShape in runtime and take advantage of its built-in auto-sizing logic that can extend the size of a container to wrap a shape. The Diagramming Framework provides a visual feedback when a shape is being dragged over a RadDiagramContainerShape and even if part of the shape is outside the bounds of the container, the framework internally handles the drop and expands the size of the container to place the shape inside the content area of the container. A container can be compared with a HeaderedItemsControl but is also a true diagramming shape which can be connected and handled like other shapes. The RadDiagramContainerShape derives from the DiagramShapeBase class and this is why it exposes similar properties to those of the RadDiagramShape. To get familiar with the RadDiagramShape features and properties, please refer to the Diagram Shapes tutorial. By default you can edit the header of the RadDiagramContainerShape out-of-the-box by double-clicking on the container or by hitting F2. If you'd like to disable the editing functionality, you can set the IsEditable property to False. You can manually put the RadDiagramContainerShape in an edit mode by setting its IsInEditMode property to True. This is the property that gets and sets the edit mode of the container. The main purpose of the RadDiagramContainerShape is to allow you to drop shapes on it thus grouping them in one container. This is why dragging and dropping shapes onto the container is the main approach for populating its __Items__collection. You can get the bounds of the RadDiagramContainerShape through the ContainerBounds property, which is of type Rect and it gets the width, height and location of the container’s bounds. With Q2 2013, you can make your RadDiagramContainerShape collapsible. In order to use such a container in your solution, you simply need to set the IsCollapsible property of the container to True. IsCollapsible: A property of type bool that controls the collapsible state of a RadDiagramContainerShape. IsCollapsed: A property of type bool that controls whether a collapsible RadDiagramContainerShape is currently collapsed. 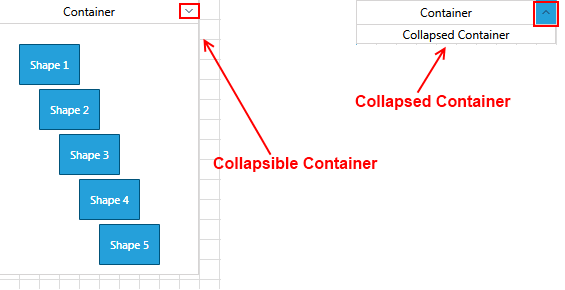 CollapsedContent: A property of type object that gets or sets an object that defines the content displayed inside a collapsed RadDiagramContainerShape. CollapsedContentTemplate: Gets or sets a DataTemplate used to display the content inside a collapsed RadDiagramContainerShape. IsCollapsedChanged: An event that is raised by a RadDiagramContainerShape to inform that the collapsed state of the shape is changed. Rotation: You can rotate only the RadDiagramContainerShape. This means that the rotation won't affect the container's children. You can find more information about shapes rotation in this tutorial. Translation: You can translate the ContainerShape along with its children. Scaling: You can scale only the ContainerShape without affecting its children scale. 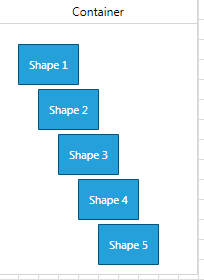 You can find more information about RadDiagramItems resizing in this tutorial. Cut and Copy: These clipboard operations work only on the ContainerShape. The shapes inside the container won't be cut or copied. You can find more information about the clipboard operations supported in the RadDiagram in this tutorial. If you do wish to rotate, scale, cut or copy both the container and its children simultaneously, you can do so by dragging a selection rectangle around the container (instead of just clicking-selecting the container). This selection will contain both the container and the children thus allowing you to perform the aforementioned actions on all items at the same time. Background: Gets or sets the brush that specifies the RadDiagramContainerShape background color. BorderBrush: Gets or sets the brush that specifies the RadDiagramContainerShape border color. BorderThickness: Gets or sets the width of the RadDiagramContainerShape outline. You can use the RadDiagram.ContainerShapeStyle property to explicitly apply a style on all RadDiagramContainerShapes in a RadDiagram instance. The ContainerService is a static class which can be used to manipulate the container shapes. This static class expose the following methods. CompleteManipulation: A void method that completes given manipulation. Accept parameter of type CompositeAsyncStateCommand. DetachItemsFromContainer: A void method that detaches items from a container. GetChildrenBounds: This method returns Rect element which wraps the items inside the container. GetContainerChildrenRecursively: This method search recursively and return all children of the container. GetFloatingChildren: This method return all shapes and connection which are not attched to shapes. GetParentContainersRecursively: This method search recursively and return all parent containers. GetRootItems: A void method the return all root containers if any exist. UpdateContainerLayout: A void method thats update the container layout. Accept parameter of type IDragDropAware. Prevent dropping a shape in container: To prevent dropping a shape inside a container, you can set the IsDropEnabled property of the RadDiagramContainerShape to False. IsDropPossible: A property of type bool that gets whether drag-drop items in this container is possible. OnDragEnter: This event is called when a dragged shape is over a container. OnDragLeave: This event is called when a dragged shape leave the boundary of the currently hover container. OnDrop: This event is called when a dragged shape is drop over a container. To subscribe to the drag/drop events you can create a custom class which derives from RadDiagramContainerShape and override the corresponding methods.